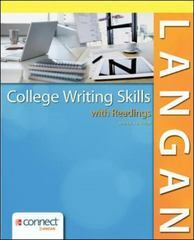 College Writing Skills with Readings 9 Edition Grounded in John Langan’s Four Bases – unity, coherence, sentence skills, and support – College Writing Skills with Readings employs a unique personalized learning plan to address student deficits in grammar and mechanics and to free instructional time for activities emphasizing writing process and critical thinking. From mastering the traditional five-paragraph essay and its variations to learning about the finer points of grammar and punctuation, College Writing Skills with Readings empowers students to think more deeply about audience and purpose as they write for college and career. This new ninth edition provides a greater balance focus on personal, academic, and workplace writing.